Photo: Great northeastern eating near Victory Monument. Are you a little bit hipster? Do you want to show off to your friends that you know somewhere to drink in Bangkok that’s off the beaten track? Can’t afford a 300 baht cocktail but fancy a bit of al fresco drinking? Then Sky Train Jazz Club is for you. Contrary to its name, Sky Train Jazz Club is not a live music venue and, more often than not, the sound system isn’t playing jazz over the speakers — though if that’s what you’re looking for, nearby Saxophone may be just the ticket. A more gritty cityscape than your average rooftop bar. 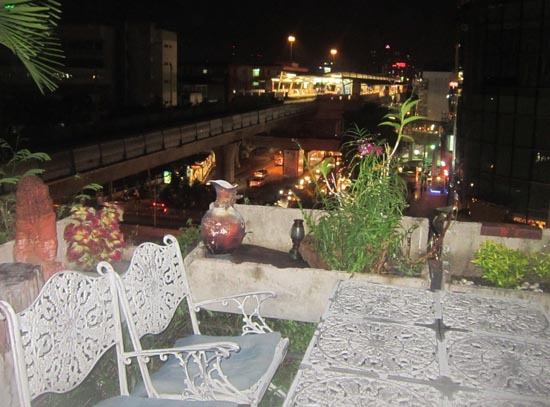 Sky Train Jazz Club is the coolest venue in the Victory Monument area and certainly the most fun and cheap rooftop bar you’ll visit in Bangkok — think 100 baht for beers and spirits. But don’t let the rooftop tag fool you into thinking you’ll be getting something high-end or exclusive here, such as say, Nest. No, instead you will enter the building through a grimy little passage, which then leads up a calf-punishing few flights of heavily graffiti-ed and low-lit stairs until you stumble into what appears to be a cluttered student living room, scattered with piles of CDs, books worth mooning over and other various knick-knacks. 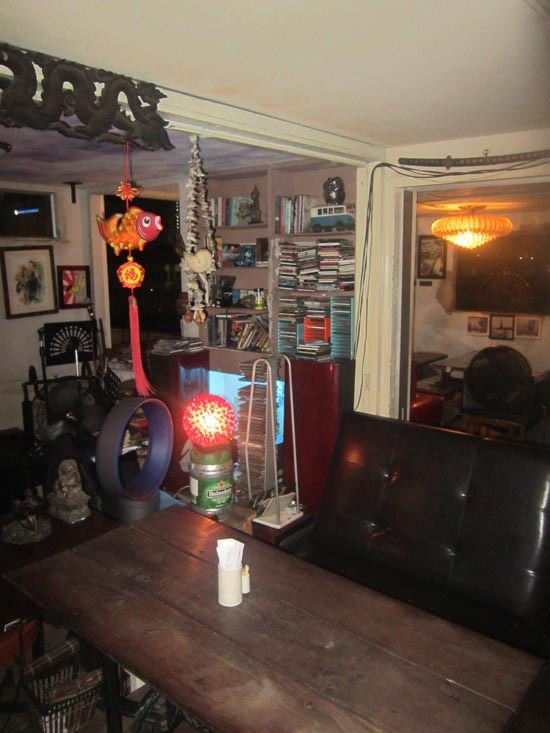 The furniture is mismatched and the place looks like it needs a good tidy. The outdoor area is well-stocked with pretty window boxes overflowing with flowers and greenery, which nicely frame the views of the Victory Monument BTS station. The rumbling of the train and the bright lights of Century Movie Plaza across the road give the bar a loud and distinctly urban — not picturesque — feel. The overall effect is that you’re in on one of the best secrets this young, vibrant city has to offer. To clarify: this is a bar, not student digs. The reasonable prices and relative obscurity of the venue means Sky Train Jazz Club draws the hipster Thai crowd, especially on weekends, when you’ll be lucky to get a table. But on any given night you’ll find the unmistakeable uniform of the cool kids; cartoon hair, exaggerated eyewear and coloured chinos with turn-ups. Gather a group of friends, order a bottle or two of Sangsom with soda and a bucket of ice and kick back, Thai style. The all-Thai menu boasts some excellent snacks to accompany your boozing. If you’re not sure what to get, there’s a handy photo-menu so you can point out a few delicious looking sharer dishes that start from around 150 baht. If you want to further enhance your own hipster cred, you may first want to tuck into some boat noodles before heading to the club.